The BBR GT270 is a special edition model from Brodie Brittain Racing. The car is based on a 2013 2.0 Sport Tech coupe (Mazda has phased out the 2.0 soft top car) and features a turbocharged engine for increased performance whilst maintaining a 3 year 60,000 mile warranty. 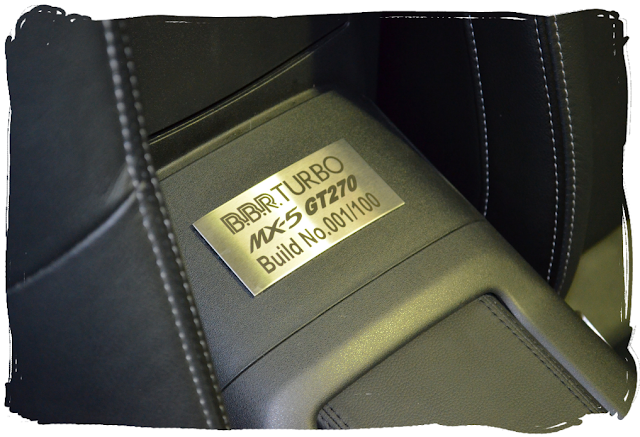 The GT270 is only available as a new car package from BBR themselves or through the MKG3000 and Romford Mazda dealerships. GT270 prices start from £29,995 and build numbers are limited to 100 cars making this a very exclusive high-performance model. BBR have been working on turbo conversions for the NC MX-5 for a while now. Their retail options are already available (there is one in the Showcase), but this is the first time they have offered a complete car package. As well as the turbo conversion, the car also benefits from ECU upgrades that include features such as launch control, the ability to shift up gears at full throttle, and an automatic throttle blip on down shifts. If that wasn't enough, there is also a range of optional extras to customise the conversion including a polished turbo compressor cover, tubular turbo manifold, BBR stainless steel exhaust backbox, polished or custom coloured intercooler pipes, custom coloured silicone hoses, custom coloured battery tray, carbon fibre turbo heatshield, and a carbon fibre airbox (as seen on the demo car). Built from a brand new 2013 model year specification MK3.5 (NC) 2.0-litre Sport Tech Roadster Coupe, the BBR GT270 leverages three decades worth of BBR MX-5 expertise with a breathtaking turbocharged engine producing 268bhp (270PS). Combined with advanced electronic upgrades and optional chassis enhancements, the all-round improvement of the Mazda coupe's dynamics is dramatic, delivering the last word in MX-5 driving excitement for the true performance enthusiast. With a strictly limited production run of 100 numbered cars, BBR has created the ultimate, exclusive MX-5 designed to appeal to both enthusiast and collector alike. 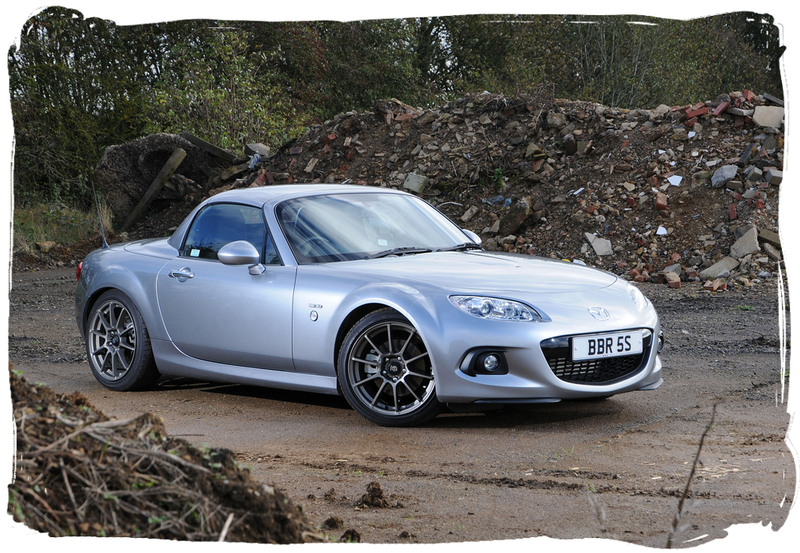 The BBR development team's primary goals for the Mazda MX-5 GT270 turbo project were to deliver stunning performance in combination with superior driveability, whilst retaining a factory feel and under bonnet appearance. 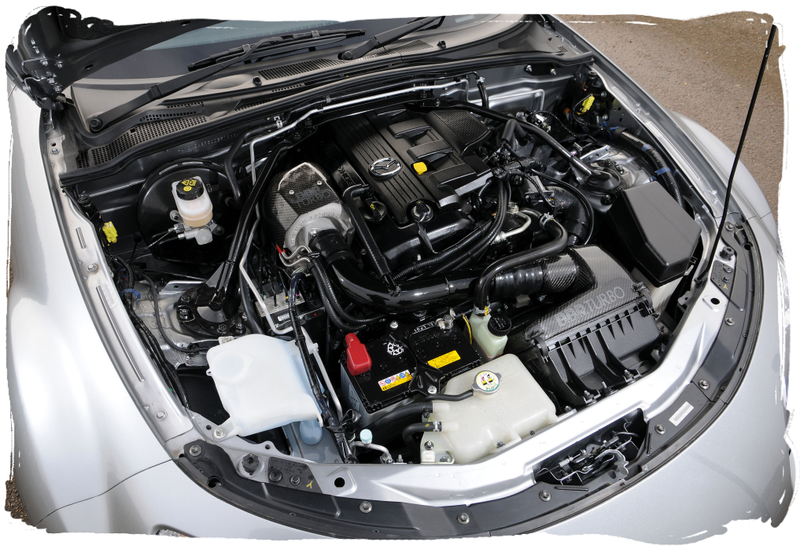 Central to the BBR GT270 driving experience is the 2.0-litre engine, which has been subject to extensive development by BBR's technicians to perfect the ideal turbocharger, exhaust manifold and intercooler combination deliver the optimal blend of performance, driveability and reliability. The BBR GT270 is the most powerful new Mazda MX-5 on sale today, producing 268bhp at 7350rpm, some 110 Bhp more than the standard 2.0-litre Sport Tech model. More impressively, the car's peak torque figure of 227lb.ft (88lb.ft more than the standard MX-5 2.0-litre Sport) arrives at 5100rpm, with over 200lb.ft available from 3000 rpm to 7000rpm, emphasising the superior driveability of the BBR car. Given the considerable torque increase over standard BBR has installed an uprated Exedy clutch with a higher clamping pressure than the factory unit to ensure longevity of the GT270's powertrain. 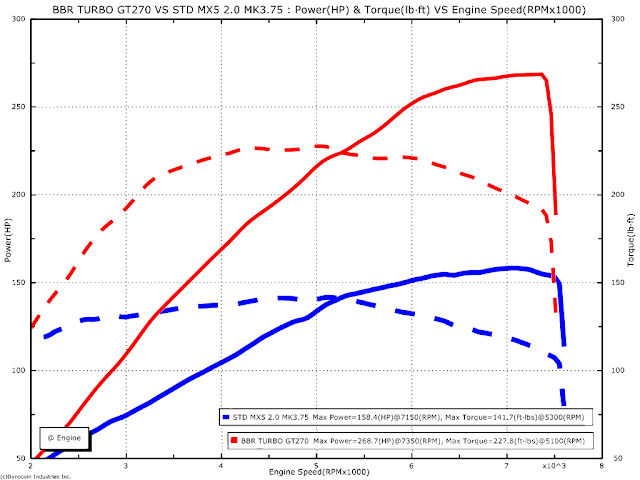 Compared to alternative normally aspirated tuned MX-5s, the GT270's quick spooling Garrett GT25 ball bearing turbo provides superior torque, power and throttle response from tickover to the rev limiter. 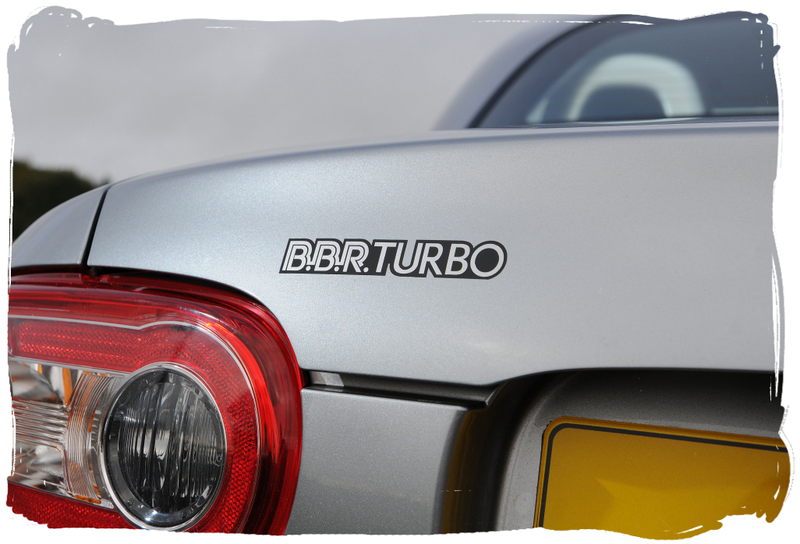 As an added bonus the inherent muffling effect of the Garrett turbocharger means that the BBR GT270's exhaust note is more muted than even the factory MX-5, resulting in civilised long distance high speed motorway cruising. Extensive work by BBR's technical development team in conjunction with industry electronics calibration specialist EcuTek has allowed BBR to debut a unique suite of 'Starchip' calibration software, which offers a greater range of functionality and control for the GT270 owner. With exciting functions including launch control, auto throttle blipper on the downshift and a full throttle gearshift, the GT270's advanced electronics are designed to enhance performance and offer economy and security functions that far exceed the capability of the standard MX-5. With a kerb weight of just 1190 kilos and supercar troubling power-to-weight ratio of 225 Bhp per ton (144 Bhp per ton standard), the BBR Mazda GT270 is capable of 0-60mph in just 4.9 seconds, culminating in an electronically limited top speed of 150mph (where permissible.) Courtesy of the substantial torque increase, in-gear acceleration is stunning, making overtaking an effortlessly exhilarating pleasure whether on an A-road, autobahn or a racing circuit. Cohesive, rapid and understated, the GT270 is the ultimate road legal MX-5. One of the most interesting features on this car is the ECU. The specially developed EcuTek ProEcu system in the GT270 gives the driver a choice of four operating modes which are selected using the cruise control stalk. Switching between the different fuel maps gives the driver more control over fuel economy and performance. There is also a security mode for when you leave the car at a garage and would rather it wasn't taken for a complimentary Italian tune-up. Mode 2 is the "race mode" and includes 3800rpm launch control, full throttle gearshift, and the auto throttle blip. 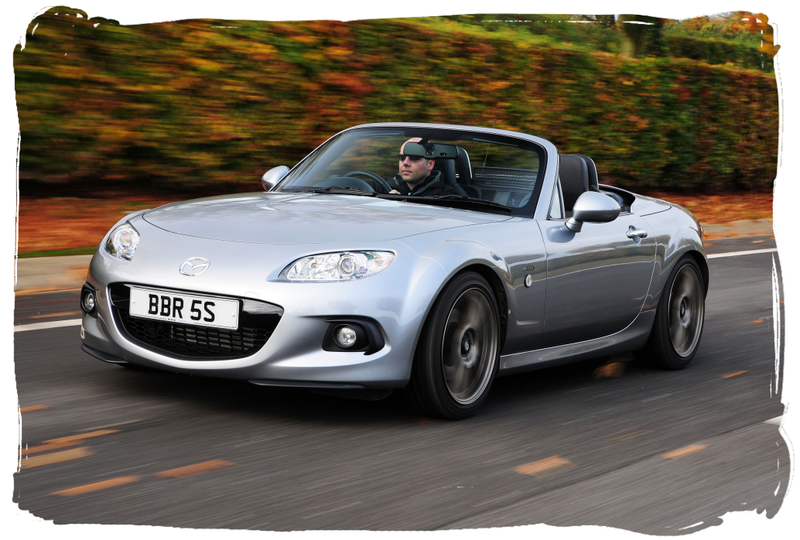 BBR are also offering a range of additional cost upgrade packs for the MX-5. These are designed to complement the GT270 and further improve it's all round performance. The suspension pack was designed in partnership with Koni and features adjustable dampers with BBR's own specification lowering springs. This setup is said to improve turn-in and give superior body control whilst still being comfortable for the driver and passenger. The demo car in the pictures is fitted with this upgrade and sits at a really nice ride height. This car is also fitted with a great looking set of Sparco Assetto Gara alloy wheels. The brake upgrade pack is designed for track day use and includes EBC Yellow Stuff pads, stainless steel brake lines and Castrol SRF brake fluid. Since the turbo conversion reduces exhaust noise to lower than the standard car, there is an optional BBR backbox (as mentioned earlier) to add a sportier note. The next step up from this is the optional 2.5" stainless steel centre section with sports catalytic converter for the ultimate road-legal setup. BBR claim their full sports exhaust system boosts the GT270's power to 302 Bhp. The GT270 is a serious competitor to the 200 Bhp Jota GT and perhaps the turbo's power advantage makes up for its lack of unique styling additions. Whichever is your preference, it's a great time to be an MX-5 enthusiast.